Born of the Gods Game Days Saturday and Sunday! Posted: Sat Mar 01, 2014 2:36 am Post subject: Born of the Gods Game Days Saturday and Sunday! Our Game Days for Born of the Gods will be March 1st and 2nd, both at 11:00 am! Entry is $4.99, which feeds prizes. Every participant gets a full art Kiora's Follower promo card, and the top 8 finishing players get a Pain Seer foil full art card. 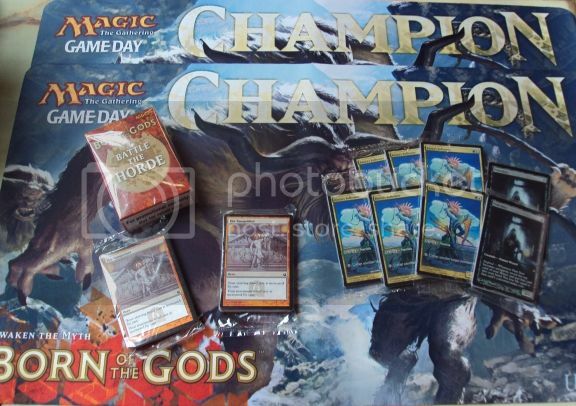 First place will also receive one of the coveted Born of the Gods Game Day Champion playmat! If you need a deck to play, the Born of the Gods Event deck released today! At $22.49 + tax, the event deck is a great starter for either a Black control deck or B/x midrange. You can find the decklist on the Wizards page! Game Day also features the next stop on the Path of the Hero. Play against the Battle the Horde Challenge deck! The Minotaur Horde was originally designed for only one player, but ask Steve or Scott how to modify the gameplay for two or more. If you enjoy the Challenge Deck experience, we'll have a limited number for people to buy and take home for $10.79 + tax. Check out our Facebook page for info on our events! The BNG Game day for Saturday can be found here, and Sunday's event can be found here!